Guns N’ Roses are streaming behind-the-scenes video from the European leg of their Not In This Lifetime world tour. The clip includes footage shot during soundchecks and on stage during the first two weeks of the summer run, which began in Berlin, Germany on June 3. 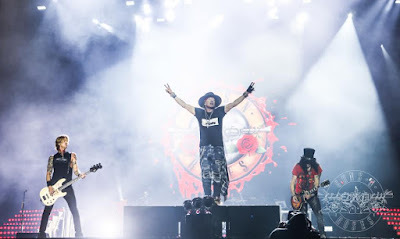 Opening night saw Guns N’ Roses deliver the live debut of the 2004 Velvet Revolver classic, “Slither”; the tune was the lead single from “Contraband”, the group's debut album – which featured GNR members Slash, Duff McKagan and Matt Sorum – and entered the US Billboard 200 at No. 1 on its way to sales of more than 2 million copies in the country. Now in its third year, the reunion trek of Axl Rose, Slash and Duff McKagan is currently playing a 7-week run of stadium shows and festivals, including appearances at Italy’s Firenze Rocks, Belgium’s Graspop Metal Meeting, and Download in the UK, Paris and Madrid. On June 29, the band will release multiple expanded reissues of their 1987 album debut, “Appetite For Destruction”, featuring memorabilia and dozens of previously-unreleased songs. Three decades after its release, the project remains the biggest-selling debut album of all time with more than 30 million copies sold worldwide.